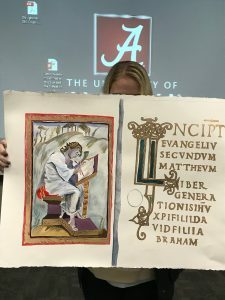 Students in Dr. Jennifer Feltman’s ARH 360-Early Medieval Art course created their own artworks as a way to reflect on the materials and methods used to make early medieval (and a few Byzantine) works of art. 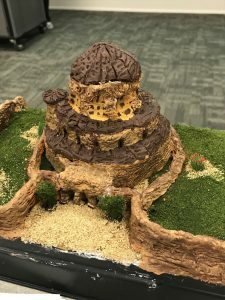 Each student chose an object that dates from between 250 and 1150, and researched the original work focusing on the materials that had been used to make it, its context, function and what it meant to the people of that time. Then, the students created their own artwork inspired by the past. 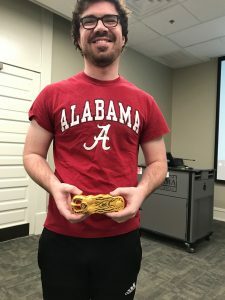 Feltman encouraged students to make connections and distinctions between the past and present. 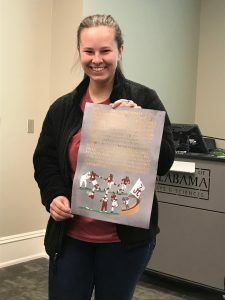 Junior Rachel Balding, a psychology major with a minor in studio art, painted a folio – or page – of text and images (see right and below). 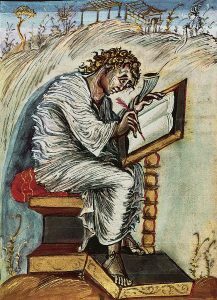 Inspired by the famous 6th century manuscript Vienna Genesis, for her project she drew an analogy between the devotion given to narratives in religious art and the football legends of UA. 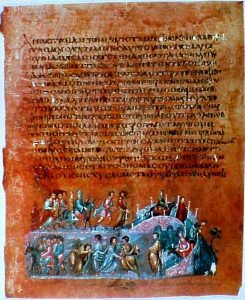 The original manuscript, an expensive object likely made for the Byzantine Emperor, was dyed purple and its script was written in silver. 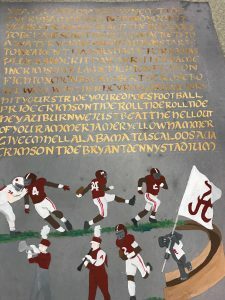 Balding dyed her page in grape juice and inscribed the UA fight song in gold using Roman Uncial script. 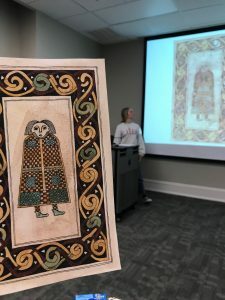 Another student, junior Elizabeth Essary, a double major in art history and studio art, created an icon using woodblock printing, a process through which multiple copies can be faithfully replicated, much like the concept of the icon as a true image itself. Above: Rachel Baldung, junior psychology major with a minor in studio art, and the Vienna Gospel folio. 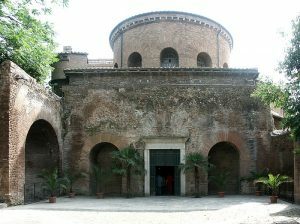 Above: Emily Craven, junior advertising major with a minor in studio art, and the Church of Santa Costanza in Rome. Above: Elizabeth Essary, junior double major in art history and studio art, and the Icon of Christ. Above: Ryan Hogan, junior double major in creative media and studio art, and the Sutton Hoo Belt Buckle. 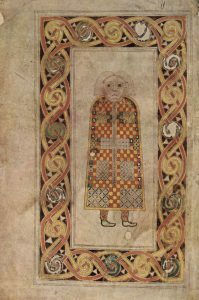 Above: Maggie Hocutt, junior BFA major in painting,with a minor in history, and the Book of Durrow. Above: Victoria Andry, senior double major in studio art and marketing, and the Matthew folio of the Ebbo Gospels. For more information about the UA Department of Art and Art History academic programs, go here: https://art.ua.edu/academics/.